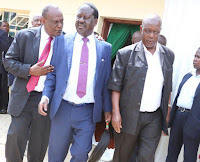 Thursday January 31, 2019-Former Jubilee Vice Chairman, David Murathe, is now a happy man thanks to President Uhuru Kenyatta. Speaking yesterday, Murathe revealed that he is a happy man because Deputy President William Ruto has been tamed following the recent promotion of Interior CS, Fred Matiang’i to oversee and implement all Government projects. He said that the recent changes in Government by President Uhuru Kenyatta have impressed him, and that there is nothing to be bitter about Ruto anymore because he is ‘useless’ now after losing his powers to Matiang’i. However, Murathe maintained that he will not stop his plan to bar from contesting for President come 2022. "I am glad that Mr. Ruto has been put in his place and Government work is now properly streamlined,” he said.